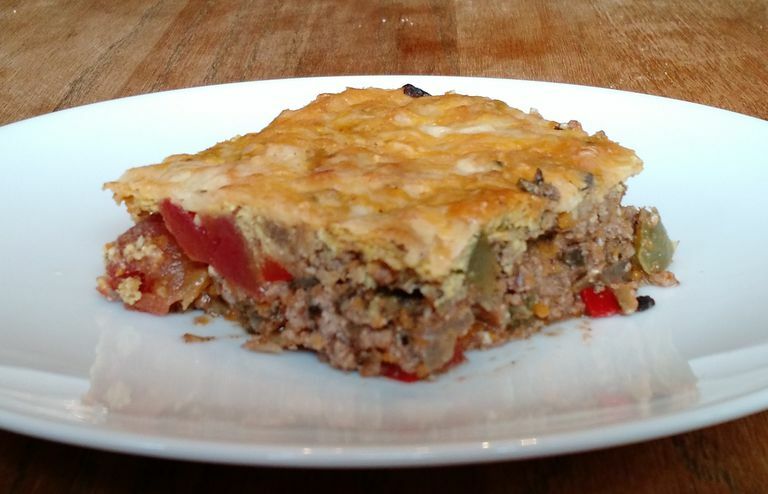 This is a low-carb version of one of the common ways of making tamale pie. It has a relatively thin top crust (and no bottom crust). You can use almond meal and whey protein powder for the crust or easily vary it. If you want a "cornier" crust, you can swap out some of the almond meal for corn meal, and add a tablespoon of water for each tablespoon of corn meal you switch. There will be 1 gram of extra carbohydrate per serving for every tablespoon of corn meal. Also, if you don't have any whey protein powder around, you can leave it out. The crust will just be a little thinner. 1) Drain the tomatoes, and save the juice. 2) Put the onion and the beef into a large skillet, and cook over medium-high heat, breaking up the beef as it cooks. When some of the fat from the beef is rendered out*, add the green and red peppers, and the chili powder. Cook until the beef is cooked through. 3) Add the drained tomatoes and the olives, and cook for another minute. Salt to taste. 4) Mix the ingredients for the crust together, except for the cheese. 5) Pour the beef and vegetables into a 9 X 13-inch pan, pour the batter for the crust over the mixture, and spread it evenly over the top. Sprinkle the cheese over the batter. 6) Bake for about 15-20 minutes, or until crust begins to brown. I usually cut it up into 12 squares, with 2 squares making a serving. Serve with a green side salad with a low-carb Lemon Garlic Salad Dressing or this Sugar-Free Thousand Island Salad Dressing.